"Well organised with clear, concise text and 'step-by-step' presentation"
"Optimism springs from every page, fuelled by an abundance of colourful images. It is well worth the cover price for its original ideas alone." "This is a handsome, inspiring volume, with ideas to pique any gardeners interest." "This sumptuous book is for amateurs and professionals alike, and is endorsed by the RHS. Absolutely fantastic and something all serious gardeners shouldn't be without." "Every project has step-by-step photographic spreads showing exactly what is required to achieve great results and including handy hints and tips." "This book is a riot of colour which will make browsing an added pleasure to the achievement. Gardeners, amateurs or professionals will love this book and enjoy many happy hours with it. What a bargain at this price." 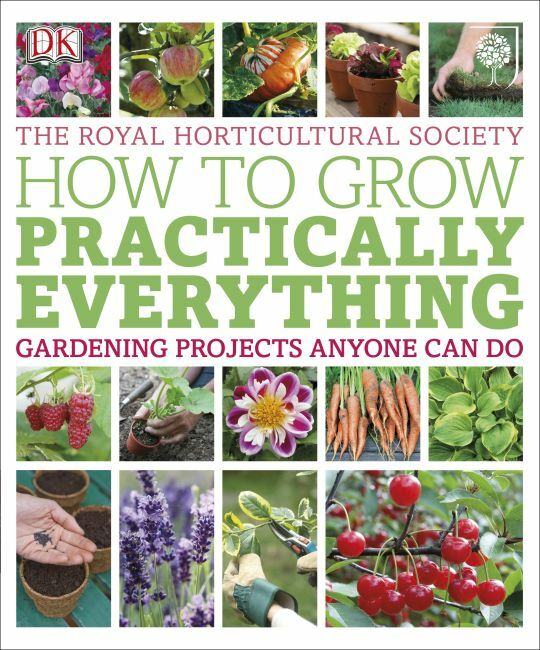 If you want to start gardening or simply improve your skills, RHS How to Grow Practically Everything will show you how. The fool-proof projects for beginners and more experienced gardeners will give you green fingers in no time. Follow the step-by-step photographs and expert advice from the RHS and have a go at practical projects for gardens large and small, from planting pots of herbs or vegetables on a patio, to making garden beds or borders for year-round colour. You'll find all the detailed guidance and suggestions you'll need on materials, plants, locations and timings, so you can get great results every time. Covering all the basics of growing and providing essential tips and techniques on aftercare, RHS How to Grow Practically Everything, now available with a new jacket and in paperback (previous ISBN: 9781405327299), is the essential, inspirational guide for every gardener.